I love ham more than turkey too. Growing up we always had both. This apple pie looks wonderful. I would choose it over pumpkin pie too. I love those apple slices peeking out of thepie. I would prefer apple to pumpkin pie and I do like both but nothing beats apple except peach. 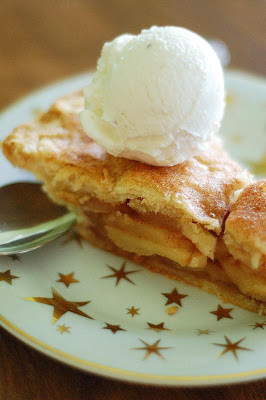 Apple pie is probably my favorite pie. And sadly, I'm not making one this year. Why? Because I might be the only one eating it! I haven't tried Dorie's, I'll have to give it a try sometime. Anne, your blog is beyond beautiful! I can't believe I only just discovered it today. Looking forward to many, many more visits!